Fronius software solutions To get the best out of your photovoltaic system. With its software solutions for energy management, system monitoring and system control, Fronius equips you with all the tools you need to use your photovoltaic system as efficiently and flexibly as possible. The intelligent energy management functions from Fronius enable you to increase your self-consumption rate, making you less reliant on the public grid. This is particularly important for system operators who want to use their self-generated power. 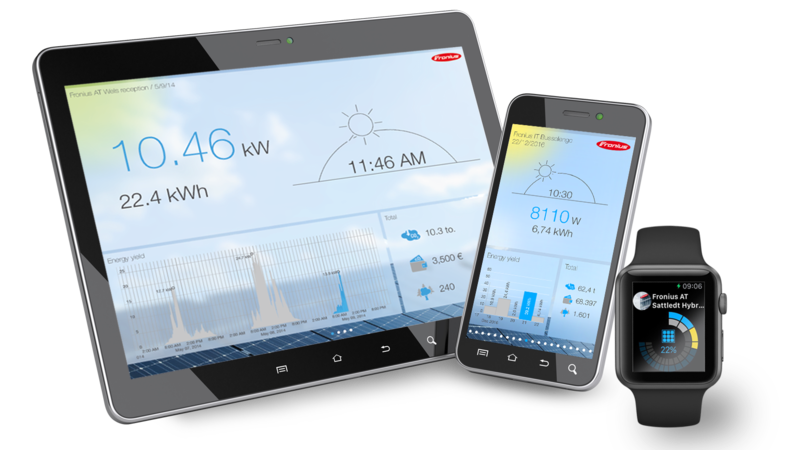 Fronius also offers system monitoring components that work in perfect harmony, allowing you to record and visualise all the relevant data relating to your photovoltaic system. Defects or malfunctions are detected and error messages issued in good time, which means they can be rectified more quickly. Continuous monitoring helps you retain the efficiency and cost effectiveness of your photovoltaic system over the long term. Many photovoltaic system owners do not use all of their self-generated solar power, but instead feed some of it into the public grid. It is important for both system operators and public utilities to be able to regulate this energy feed-in. Fronius therefore offers a range of options you can use to control the output of your photovoltaic system flexibly and according to demand. Control the output of photovoltaic systems flexibly and according to demand. System monitoring from Fronius optimises your photovoltaics. Fronius energy flow management increases self-consumption rate of solar power.